The let-7 miRNA family consists of 11 closely related genes. The gene for let-7a is located on the chromosome 22q13.31 and is associated with CpG islands. Let-7a-5p is a microRNA, which inhibits migration, invasion, as well as epithelial-mesenchymal transition by targeting several oncogenes. Moreover, cell proliferation, colony formation, migration and invasion were decreased after induced overexpression of let-7a in breast cancer cells. Deregulation of miR-let-7a-5p is associated with oncological diseases. 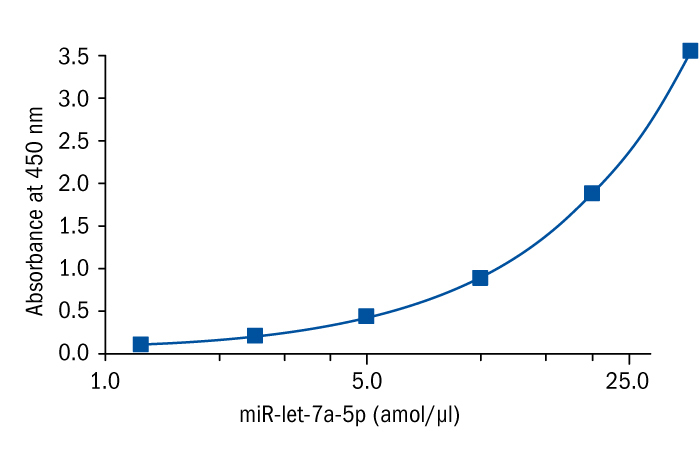 Thus, miR-let-7a acts as a tumor suppressor and is down-regulated in many types of cancer. Reduced levels of miR-let-7a-5p were reported in lung squamous carcinoma, colorectal cancer, urothelial tumors, lymphoms, breast cancer and many other diagnoses. Apart from its role in tumor suppression, involvement of miR-let-7a, in cell proliferation pathway in human cells has been reported, and its connection to cerebrovascular and neurodegenerative diseases has been observed. miRNA-let-7a has been shown to directly alter cell cycle progression and proinflammatory cytokine production in brain. In response to inflammation, miR-let-7a participates in reduction of nitrite production and expression of inducible nitric oxide synthase (iNOS) and interleukin-6 and is involved in increased expression of brain-derived inflammatory cytokines in microglia. Thus, miRNA-let-7a could act as a regulator of the function of microglia in inflammation. REINHART, Brenda J., et al. The 21-nucleotide let-7 RNA regulates developmental timing in Caenorhabditis elegans. nature, 2000, 403.6772: 901. BRUECKNER, Bodo, et al. The human let-7a-3 locus contains an epigenetically regulated microRNA gene with oncogenic function. Cancer research, 2007, 67.4: 1419-1423. TSANG, Wing Pui; KWOK, Tim Tak. Let-7a microRNA suppresses therapeutics-induced cancer cell death by targeting caspase-3. Apoptosis, 2008, 13.10: 1215-1222. LIU, Tsang-Pai, et al. Down-regulation of let-7a-5p predicts lymph node metastasis and prognosis in colorectal cancer: Implications for chemotherapy. Surgical oncology, 2016, 25.4: 429-434. TAO, Jun, et al. Identification of circulating microRNA signatures for upper tract urothelial carcinoma detection. Molecular medicine reports, 2015, 12.5: 6752-6760. SAMPSON, Valerie B., et al. MicroRNA let-7a down-regulates MYC and reverts MYC-induced growth in Burkitt lymphoma cells. Cancer research, 2007, 67.20: 9762-9770. LIU, Kui, et al. Let-7a inhibits growth and migration of breast cancer cells by targeting HMGA1. International journal of oncology, 2015, 46.6: 2526-2534. JOHNSON, Charles D., et al. The let-7 microRNA represses cell proliferation pathways in human cells. Cancer research, 2007, 67.16: 7713-7722. CHO, Kyoung Joo, et al. MicroRNA-Let-7a regulates the function of microglia in inflammation. Molecular and Cellular Neuroscience, 2015, 68: 167-176. CHAFIN, Cristen B., et al. MicroRNA-let-7a promotes E2F-mediated cell proliferation and NFκB activation in vitro. Cellular & molecular immunology, 2014, 11.1: 79.